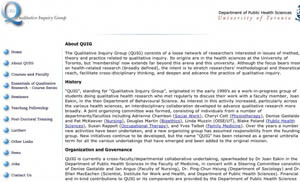 Active and growing since the early 1990’s QUIG is a loose collectivity of qualitative researchers (faculty, students and research institute scientists) mostly in but not limited to the health sciences and adjacent applied health research fields. •To build local, national and international capacity in critical, theoretically-informed qualitative health research, scholarship and teaching. •To promote innovation and knowledge development at the leading edge of the field. •To be a site of expertise in the particular challenges of teaching and practicing qualitative research in the health research field. •To anchor, connect, challenge and inspire qualitative researchers across health-related disciplines and institutional units. • To function as a ‘go-to’ site for issues of methodology and teaching. •To provide superior graduate education in qualitative research methodology. QUIG asserts a particular and distinctive identity: a place that strives to raise the bar on the teaching and practice of qualitative research in the heath field through the promotion of a ‘critical’ and ‘theoretically- informed’ perspective on method and on substantive topic. • By ‘raising the bar’ is meant going beyond conventional expectations regarding the quality of this type of research inquiry, demanding a superior level of scholarship and academic leadership in this area. •By ‘critical’ is meant the capacity to inquire ‘against the grain’: to question the conceptual and theoretical bases of knowledge and method, to ask questions that go beyond prevailing assumptions and understandings of phenomena, to acknowledge the socio-political dimensions of health and health research. • By ‘theoretically-informed’ is meant the reflexive, competent and creative application to the research process of social theory and theory from other disciplines. • Website: maintenance of a accessible, vibrant electronic site for the banking and exchange of ideas and resources. • Inventories of education resources across the University of Toronto: searchable listings of qualitative methodology courses and faculty are available electronically on the current website. • Essentials of Qualitative Research (EQR)course series: a coordinated sequence of graduate courses in research methodology associated with a Certificate of ‘advanced’ competency. Demand is growing and new courses and program partners are being initiated. • Seminar Series: two series 1) seminars on methodology and theory by established researchers and visiting scholars, and 2) student seminars for those with research-in-progress. • Listserv network of researchers: currently ~ 500 faculty, students and researchers from the University of Toronto, other universities in Ontario, university affiliates and research institutes. • Institutional research outreach: links have been established with key qualitative researchers in hospitals and research institutes around the University of Toronto. • Inter-University network: links with several universities outside of the University of Toronto. •International network: collaboration between researchers in health science settings in other countries through a network of Centres with a similar mission, such as the PROGIECS, Qualitative Health Research and Evaluation Program at the Faculty of Medicine, Universidad de Guadalajara, Mexico and the REDICS, the Spanish Qualitative Health Research Network. • Visiting Professor and post-doctoral program: to advance faculty ability to teach qualitative methodology. The focus has so far been on the development of teachers in developing countries, but the plan is to extend this to meet the needs of Canadian faculty scattered thinly and in isolation in health faculties across the country. It is anticipated that the Centre can also offer opportunities for post-doctoral fellows interested in qualitative methodology. • Teaching symposia: In 2004 QUIG hosted a national invitational workshop on teaching qualitative health research in the health sciences. A second symposium, this time international, is planned for winter 2010. • Consultation and advocacy (informal) re educational resources, thesis supervision, publication, research funding, project staffing, publication, technology advice, among other topics.